FARNBOROUGH, UK -- Sept. 21, 2015: BMW’s compact Sports Activity Vehicle, the X1, has been a huge success since its launch in 2009. More than 730,000 were sold globally of that first generation with nearly 40,000 new owners of X1 in the UK over the same period. Now an all-new BMW X1 has been unveiled and features dynamic BMW X styling, a sporting character blended with outstanding efficiency, and an array of innovative equipment features in comfort, safety and infotainment. Featuring an all-new range of engines and gearboxes, not to mention the latest, ultra-efficient version of the xDrive all-wheel-drive system, the second generation of the BMW X1 exemplifies BMW’s EfficientDynamics philosophy. At market launch, one petrol engine and three diesel options are offered. See more info at the bottom of the page. Robust proportions, sculpted surfaces and genre-specific design features clearly mark the X1 out as a member of the BMW X model family. The front is defined by the large, upright BMW kidney grille, three-section lower air intake and characteristic “four-eyed” look formed by the twin circular head lights and fog lamps. Standard specification for the new BMW X1 includes LED daytime driving lights and for xLine and M Sport models full-LED headlights for low and high beam. This is optional for Sport line models. The new car has grown most notably in height compared to its predecessor (+53mm), which helps to create extra space in the interior. When viewed from the side, the window surfaces taper towards the rear creating a particularly dynamic impression. At the rear, the central section of the rear apron rises up significantly, mimicking the frontal styling. Customers can choose from two non-metallic and 11 metallic exterior paint finishes for their new BMW X1, while the Estoril Blue metallic shade is also offered exclusively for the M Sport model. The versatility typical of this new BMW X model is expressed not only in the driving characteristics of the X1 on various types of terrain and the sporting exterior looks, but also in the way its interior can be used, with more space for passengers and luggage. On the inside, the new X1 strikes a fine balance between driver focus and practical elegance. The flat surfaces of the instrument panel and centre console controls are angled towards the driver, while the controls located in the lower section are surrounded by high-quality surfaces and are separated from the front passenger side by a newly designed bar. The instrument cluster, consisting of two circular instruments and framed by a small binnacle, also helps the driver to focus on the driving experience. Meanwhile, the iDrive operating system’s Control Display comes in the form of a 6.5-inch or, optionally, 8.8-inch freestanding monitor. Navigation is standard on the new X1, as it is on all BMWs from September onwards. The rear seat bench comes as standard with a three-section split/folding backrest and is available as an option with the ability to slide forwards and backwards by 13cm. The xLine model features a BMW kidney grille with bars that are matt aluminium at the front, with matt silver accents for the air intakes, side skirts and underbody protection. The interior trim comprises Dakota leather with perforated and contrast stitching, available in Mocha, Oyster, Black or Canberra beige with black accents and interior trim strips in high-gloss Black with accent strips in Pearl Gloss Chrome. This pack also benefits from LED headlights and heated front seats. The Sport Line model features black BMW kidney grille bars, air intakes with accents in high-gloss Black and underbody protection in Black Silver with an inlay painted – like the side skirts – in body colour. The interior of the Sport Line model features black sports seats with either red or grey accents, and interior trim strips in high-gloss Black or aluminium with accent strips in matt Coral Red. M Sport models are fitted with a model-specific M aerodynamic package and 18-inch or optionally 19-inch M light-alloy wheels. This pack also benefits from LED headlights. The interior features heated front sports seats in anthracite-coloured cloth/Alcantara with blue accents, and Aluminium Hexagon interior trim strips with accent strips in matt Blue. An M leather steering wheel and a BMW Individual headliner in Anthracite are also specified. Dakota leather trim with perforation in several colours is also available as an option exclusively for the Sport Line, xLine and M Sport models, and a selection of other interior trim strip variants can be specified. Added to which, all equipment lines include 18-inch light-alloy wheels in their own specific design, exclusive door sill plates and an LED lighting package with vicinity and door handle lights, ambient lighting with variable use of colours and LED optical fibres in the door panel trim. The new BMW X1 uses completely new powertrain and chassis technology: front/transverse-mounted four-cylinder engines from the BMW Group’s latest generation, and a newly developed BMW xDrive intelligent all-wheel-drive system or an advanced front-wheel-drive configuration, depending on the model variant. Agility has been enhanced by the new chassis, which ensures not only precisely controllable handling but also noticeably improved ride comfort. Together with the car’s low centre of gravity, virtually perfect 50:50 weight distribution, a wide track, short overhangs, optimised weight and the impressive rigidity of the body and chassis, this lays the foundation for a typically sporty BMW driving experience. The new BMW X1 will be available from launch with one petrol and three diesel units, each with 2.0-litre displacement and BMW TwinPower Turbo technology. The BMW X1 xDrive20i is powered by a 192hp version of the same, new, four-cylinder petrol engine, whose peak torque of 280Nm can also be accessed from just 1,250rpm. This power unit also combines as standard with the eight-speed Steptronic transmission. The new BMW X1 xDrive20i sprints from 0 to 62mph in 7.4 seconds, with an average fuel consumption is 44.8mpg and, while CO2 emissions come in at 146g/km. Turbocharging and common-rail direct injection with solenoid valve injectors imbue the new diesel engines with excellent pulling power and further enhanced efficiency. Under the bonnet of the new BMW X1 xDrive25d, multi-stage turbocharging with variable turbine geometry in both the high-pressure and low-pressure chargers ensures instantaneous power delivery, which is sustained into the higher rev ranges. The unit’s injection system operates with a maximum pressure of 2,500bar. With a maximum output of 231hp, the new engine is the most powerful four-cylinder diesel ever fitted in a BMW and its peak torque of 450Nm is available between 1,500 and 3,000rpm. It accelerates the new BMW X1 xDrive25d (with standard-fit eight-speed Steptronic transmission) from 0 to 62mph in 6.6 seconds, and posts an average fuel consumption of 56.5mpg and CO2 emissions of 132g/km. The BMW X1 xDrive20d and BMW X1 sDrive18d feature turbochargers with variable turbine geometry, and an injection system operating at a maximum pressure of 2,000bar. In both cases, maximum output is up 7hp on their predecessors, standing at 190hp and 150hp respectively. The peak torque outputs of 400 and 330Nm ensure outstanding flexibility. The new BMW X1 xDrive20d, which is fitted as standard with the eight-speed Steptronic transmission (manual transmission available from November 2015), accelerates from 0 to 62mph in 7.6 seconds, while the new BMW X1 sDrive18d completes the same sprint in 9.2seconds. This increased performance is combined with lower fuel consumption and emissions. The new BMW X1 xDrive20d, for example, posts figures of 57.6mpg and 128g/km, while the new BMW X1 sDrive18d records 68.9mpg (65.7mpg) and 109g/km (114g/km). 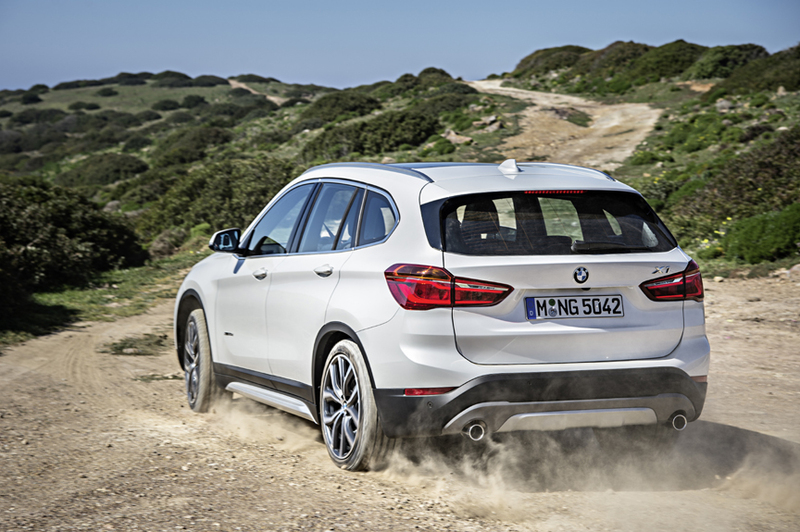 The new BMW X1 sDrive18d is fitted as standard with a new six-speed manual gearbox. An eight-speed Steptronic transmission is also available, which is fitted as standard on all other models. It features improved internal efficiency, increased smoothness and more dynamic gear changes. The BMW X1 xDrive18d models and xDrive20d will be launched November 2015 and feature a six-speed manual gearbox as standard, with the option of an eight-speed Steptronic transmission. The xDrive intelligent all-wheel-drive system is also available in updated form for the second generation of the BMW X1. The compact, low-weight and efficient all-wheel-drive system distributes the engine’s power between the front and rear axle exactly as the situation requires – at all times. Linking up with DSC (Dynamic Stability Control) allows the system to act pre-emptively to counteract any imminent oversteer or understeer by diverting power to the wheel or wheels where it can be transferred to the road to maximum effect. The system consists of a single-speed bevel gear in the front-axle drive unit (a power take-off), and a rear-axle drive unit with an electro-hydraulically controlled hang-on multi-plate clutch. The DSC system keeps the control unit constantly supplied with important data for analysing the driving situation including the car’s speed, lateral and longitudinal acceleration, steering lock, wheel speed, pitch, accelerator position and the Driving Experience Control and DSC settings. The chassis technology of the original X1 has been totally redeveloped for the new model and now comprises single-joint strut suspension at the front and a multi-link rear axle. Aluminium swivel bearings, as well as axle carriers and control arms made from high-strength steel, reduce weight and increase the rigidity of the front axle. The rear axle also employs a high proportion of high-strength steels. Tube-shaped anti-roll bars at the front and rear axle, innovative axle mounting and specially tuned elastokinematics contribute to agility and ride comfort, as do the connection of the dampers to the body via sophisticated three-way support mounts. 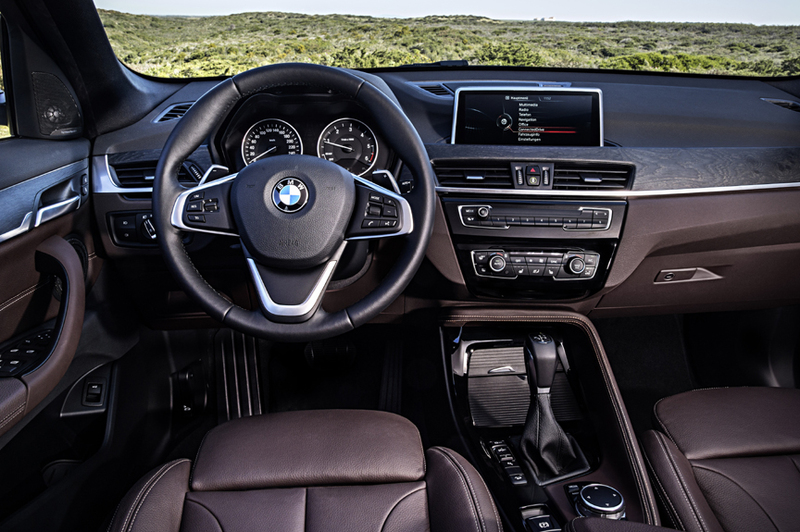 The new BMW X1 is equipped as standard with Servotronic speed-sensitive steering assistance, while a new item on the options list is Variable Sports Steering. This system allows parking and turning-off manoeuvres to be completed safely and comfortably with little steering effort, with very precise steering at higher speeds. M Sport suspension is also available as an option, featuring firmer spring and damper settings and a 10mm lower ride height. Moreover, the BMW X1 will be offered for the first time with the option of BMW’s Dynamic Damper Control system. The electronically controlled dampers improve the primary and secondary ride of the new BMW X models while sharpening further their dynamic performance: two damper control settings can be activated using the Driving Experience Control switch. The Driving Experience Control switch on the centre console is available as standard equipment allowing the driver to select either COMFORT, SPORT or ECO PRO modes at the touch of a button, adapting the responses of the accelerator pedal, gearbox, damper settings and steering. The DSC stability system includes features such as the Anti-lock Braking System (ABS), Dynamic Traction Control (DTC), Cornering Brake Control (CBC), Dynamic Brake Control (DBC), Brake Assist system, Fading Compensation, a Dry Braking function and a Start-Off Assistant. Other technology available to customers includes the trailer stabilisation function, Active Differential Brake (ADB) function and Performance Control. When DSC is deactivated, an electronic locking function for the front axle differential – known as Electronic Differential Lock Control (EDLC) – comes into play. In tight corners it brakes a spinning wheel as required and ensures power is diverted to the other wheel. BMW EfficientDynamics in the new BMW X1: Complete package ensures exceptional efficiency. The enhanced functional effectiveness of all powertrain components, intelligent energy management, the rigorous application of BMW lightweight technology and far-reaching measures designed to optimise aerodynamics all play a role in ensuring the BMW X1 generation change has brought with it significant advances in efficiency. The innovations developed under the BMW EfficientDynamics banner form an overall package that delivers greater driving pleasure combined with up to 17 per cent lower fuel consumption and emissions, depending on the model, plus lower weight yet extra rigidity for the body and chassis. Systematic improvements have also been made to the aerodynamics of the new BMW X1. Air flaps in the BMW kidney grille and the front apron’s lower intake can be actively shut off when the cooling requirement is low, reducing drag at the front of the car. The Air Curtains integrated into the outer air intakes channel the onrushing air precisely behind the front side panels, causing it to hang over the wheels like a curtain and thus reduce turbulence. The new BMW X1 also has smooth under-body panelling, air deflectors on the front wheel arches and vertical aeroblades, which form a unit with the roof spoiler to channel the airflow around the rear of the car to best effect. With the drag coefficient (Cd) of the X1 now as low as 0.29, depending on the model variant, the new model cuts efficiently through the air. All the engines in the BMW Group’s new generation of power units work with the latest incarnation of BMW TwinPower Turbo technology. This contains elements such as turbochargers integrated into the exhaust manifold, plus the most recently updated generation of VALVETRONIC for the petrol engines and a common-rail direct injection system working at even higher pressure for the diesel units. The impressive functional effectiveness of the new power units is also assisted by an aluminium crankcase and cylinder heads, forged steel crankshafts with an integrated balancer shaft drive, low-weight pistons, forged connecting rods, friction-reduced cylinder coatings and map-controlled oil pumps. With their reduced weight and enhanced internal efficiency, the new six-speed manual and eight-speed Steptronic transmission also help to optimise efficiency. The manual gearbox has a centrifugal pendulum absorber in the dual-mass flywheel, smoothing out rotational oscillations occurring at low engine speeds. This increases comfort when the driver is keeping revs low to enhance economy. Meanwhile, the reduced converter slip of the new automatic transmission cuts energy losses, and its wider gear spread keeps revs lower at higher vehicle speeds. The latest version of the BMW xDrive intelligent all-wheel-drive system is considerably lighter than before. Furthermore, the powertrain’s torque losses in normal driving situations are reduced by around 30 per cent thanks to the new hang-on multi-plate clutch. The BMW EfficientDynamics technology employed in the new BMW X1 includes intelligent energy management. Brake Energy Regeneration enables extremely efficient power generation for the on-board power supply. The Electric Power Steering and on-demand fuel and coolant pumps work with maximum efficiency, while shorter glow phases reduce the amount of energy required when starting the diesel engines. The Optimum Shift Indicator and Auto Start Stop function are also part of the standard specification. ECO PRO mode – activated via the Driving Experience Control switch – also allows drivers of new BMW X1 models with eight-speed Steptronic transmission to make use of the coasting function. At speeds between 31–99mph the powertrain is disengaged as soon as the driver takes his or her foot off the accelerator. Further efficiency gains have been achieved with items including reduced-friction wheel bearings and tyres with lower rolling resistance. Finally, an intelligent mix of materials for the body structure and chassis components of the new BMW X1 allows increased agility, lower vibrations and enhanced safety to be combined with optimised vehicle weight. Body and equipment: More space and comfort. The new BMW X1 offers more space for passengers and luggage and new options for varying its load-carrying capacity. The raised seating position (by 36mm in the front and 64mm in the rear compared to the predecessor model), the increased headroom, shoulder room and elbow room available to all occupants, along with the horizontal surface design in the interior, create generous levels of space and an ambience typical of a Sports Activity Vehicle. Knee room at the rear has increased by 36mm in standard specification and by up to 66mm with the optionally adjustable rear seat, while boot capacity of 505 litres represents an 85-litre improvement on the first-generation X1 and can be increased further to as much as 1,550 litres by folding down the standard 40:20:40-split rear seat. A 60:40-split rear bench is optionally available with individual elements that can slide forward or back by up to 13cms, allowing seating comfort and storage capacity to be adjusted to any given situation. The folding process for the backrests can be initiated electrically from the boot area at the touch of a button. As an option, the front passenger seat backrest can also be folded down, further increasing variability. The standard automatic tailgate makes using the X1’s load-carrying capacity even easier and the Comfort Access option also includes a hands- free tailgate opening and closing function. In addition, the new BMW X1 is offered from the factory with a trailer coupling including removable ball head, as well as preparation for a rear luggage carrier rack. 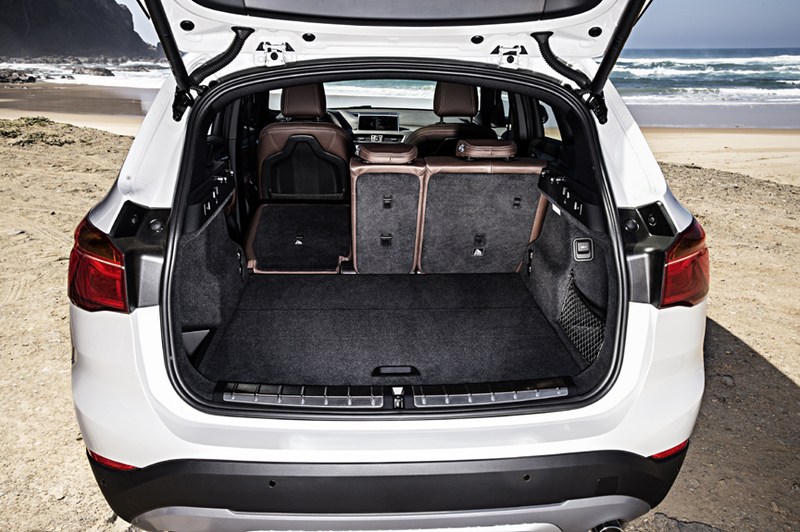 The passenger compartment of the new BMW X1 has large door pockets offering space for items such as one-litre bottles, plus a selection of other storage areas including armrest for the driver and front passenger with integrated storage compartments and a storage packages. The latter includes features such as compartments under the front seats, nets in the backrests of the driver’s and front passenger seat, a central armrest with cupholders for the rear, additional 12-volt sockets and a strap and net for securing smaller items of luggage in the boot area. Among the items on the options list is a Panorama glass roof covering a 1,200mm x 847mm area, a CD player, a Digital Audio Broadcasting (DAB) receiver and Harman Kardon HiFi system, complete with 12 loudspeakers and a digital amplifier with 360-watt output. From a safety aspect, the X1 provides active guard as standard which includes: Forward vehicle collision warning with audible and visual warnings to the driver. Brake preconditioning, when driving over 30mph an urgent warning activates brake preconditioning to prepare brakes ahead of driver use. And City collision mitigation, proactively engages braking (up to 30 mph) for rapid reaction to potential vehicle collisions. BMW ConnectedDrive in the new BMW X1: Progress through intelligent connectivity. Once again, BMW ConnectedDrive is leading the way in offering innovative solutions to today’s drivers. The navigation option assists route guidance on the standard-fitted Control Display with direction arrows and sophisticated map graphics, including views from various angles. A further option is BMW’s Navigation Plus system, which comprises a bigger, now 8.8-inch, Control Display, an instrument cluster with extended features, a split-screen function for the Control Display as well as the BMW Head-Up Display. The camera-based assistance systems available include the Driving Assistant with Lane Departure Warning, Speed Limit Info with No Passing Info display, the BMW Selective Beam anti-dazzle High Beam Assistant, as well as Collision Warning and Pedestrian Warning with City Braking function. In addition to these functions, the Driving Assistant Plus line- up also features the Active Cruise Control system with Stop & Go function – which maintains both a desired speed between 19–87mph as entered by the driver and the safety distance to vehicles travelling ahead – and the Traffic Jam Assistant. Park Distance Control and the rear-view camera, plus Parking Assistant are also available. The ConnectedDrive Services option enables the use of the BMW Online internet portal via the SIM card embedded in the vehicle, as well as the integration of smartphone apps into the car. Standard features also include the Intelligent Emergency Call and BMW Teleservices. 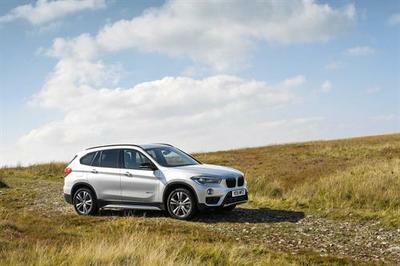 BMW UK expects to sell 8,000 BMW X1s in its first full year of sales. The BMW X1 goes on sale 24 October, 2015.